Designed for rapid acquisition capabilities, the newly introduced AeroDR HD is a high sensitivity, high-definition flat panel detector delivering 100-micron pixel size for a 3488 x 4256 pixel count—four times more than standard resolution according to Konica Minolta Healthcare. The high resolution capability and small pixel size can provide more insight into subtle anatomic details, often critical for an accurate diagnosis. 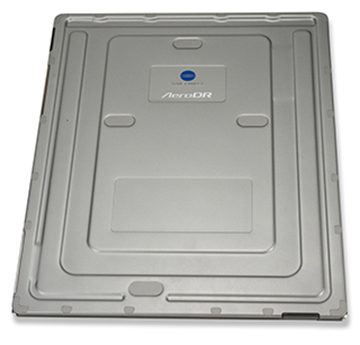 The Konica Minolta AeroDR HD Wireless Flat Panel Detector measures 14 inches by 17 inches and weighs 5.7 pounds, making it ideal for tabletop or cross-table use in the ER or other spaces across the hospital. Designed for portability with a protective waterproof enclosure and a new ergonomic design, it absorbs impacts from bump and drops and has higher drop resistance, higher load resistance, and higher bend resistance. Even in achieving crisp, clear visualization in a variety of settings, the technology is still dose efficient to patients. The new AeroDR HD Detector is fully compatible with the family of other AeroDR detectors. “The AeroDR HD Detector utilizes so many more pixels per image, specialists are able to see areas of interest in exquisite detail for better, faster patient care decisions,” said Guillermo Sander, Senior Strategic Marketing Manager of Digital Radiology at Konica Minolta Healthcare Americas, Inc. The company also launched the AeroRemote monitoring service for Konica Minolta AeroDR Systems. AeroRemote is a cloud-based, active monitoring solution that detects and reports critical and ongoing performance issues with the AeroDR Wireless Flat Panel Detectors, providing automatic reports that can be reviewed anywhere, anytime that allows for immediate intervention and the ability to address potential system or user issues early, before they escalate. AeroRemote offers secure, real-time information needed to maximize system utilization, minimize service interruptions, and evaluate personnel performance, enabling better decisions, sooner. It produces monthly reports, by system and user, detailing usage and personnel productivity, providing at-a-glance information that facilitates a more efficient operation, supports user best practices, and optimizes AeroDR imaging assets. Using predictive analytics, AeroRemote gathers hardware status to prescribe actions before an unexpected issue arises, saving downtime by scheduling service before problems occur. Real-time monitoring of system parameters and events—from drop detection to component performance—lets users make faster and better-informed support decisions. Additionally, it encourages proper user handling by alerting managers when a digital radiography (DR) panel has been dropped and sends diagnostic information on panel performance using the panel check tool. “AeroRemote reflects the transformation of service that’s under way,” explained Steven Eisner, Senior Product Marketing Manager, Konica Minolta Healthcare Americas, Inc. “It represents an important step in proactive management by providing more data to make better service and usage decisions that can reveal a lot of information, improving productivity and maximizing patient safety. For more information, visit www.konicaminolta.com/medicalusa. Konica Minolta Introduces High-Definition DR Panel and Active Monitoring Solution. Appl Radiol.